We are now accepting applications for Junior Infants for 2019/2020. Please complete application form online by clicking HERE. 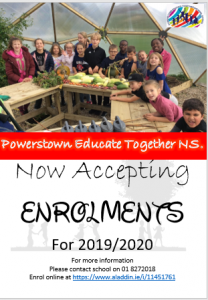 You can contact the office on 01 8272018 or info@powerstownet.com for further information. We will then forward you registration forms from Week 3 of November (after November 21st) via email. • Applicants must be at least four years of age by September 30th in the year in which they start school. 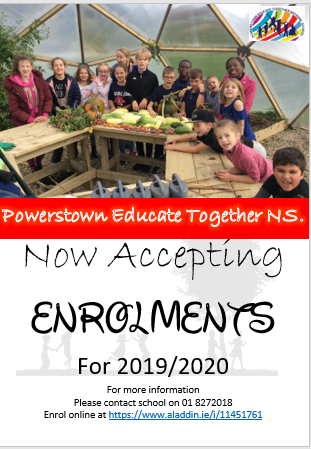 • Parents who have completed the expression of interest form will be contacted via email to verify if they wish to proceed with their child’s registration in PETNS during week 1 of November. Replies must be received within 10 working days. • Registration forms for Junior Infants will only be available in PETNS from week 3 of November of the year prior to the year of entry. • Parents/Guardians have two weeks (10 working days) to return completed registration forms and relevant documentation to register their child in order to be considered for the first round of offers. • Any applications received after the first round of offers have been made, will be added to the PETNS waiting list. The dates of second and subsequent rounds of offers will be decided on by the BOM of PETNS.